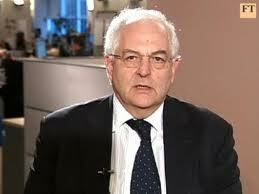 Tax Justice Network: Do low taxes promote growth and prevent crises? Do low taxes promote growth and prevent crises? We missed this article a couple of weeks ago from Martin Wolf in the FT, but it is a good one, looking at the debate (may we say hysteria?) in the United States over tax levels. 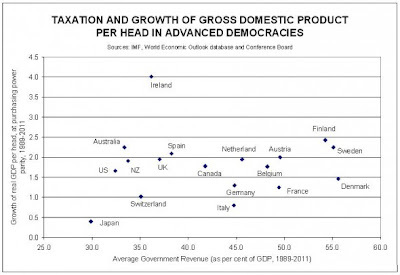 "The spread in the average tax ratio is quite large, at 26 per cent of GDP, from Japan to Denmark. It is even quite surprising that such a spread seems to have no effect on economic performance." 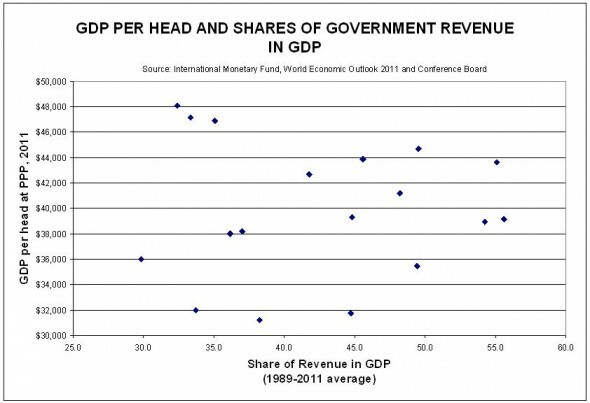 "There is no relation between the share of government revenue and the rate of growth of real output per head (that is, productivity) over the 1989-2011 period. The “regression line” is flat. 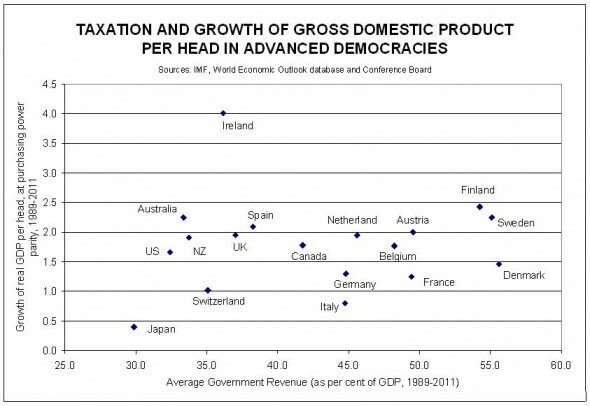 We see low tax countries with low productivity growth (Japan) and high tax countries with high productivity growth (Finland and Sweden)." And then he points to the fact that the countries of Europe which have the highest shares of taxes in their economies are the most crisis-free ones, while the low-tax economies such as Ireland, Italy and Spain, are the most crisis-hit. The crisis is clearly not one of welfare states. "The conclusion to be drawn is that a tax burden within the range of 30 per cent to 55 per cent of GDP) tells one nothing about a country’s economic performance. It is far more a reflection of different social preferences about the role of the state. What matters far more are culture, quality of institutions, including law, levels of education, quality of businesses, openness to trade, strength of competition and so forth." There is no rocket science here - reputable economists have known this for a long time. Hat tip: here, via here. What if the relationship is nonlinear? This means that if we were to lower our taxes, we also could be in a deep crisis?